It is with particular joy, on the feast of Saint Andrew the Apostle, Patron of the Ecumenical Patriarchate, that I convey my sentiments of deep affection, together with the assurance of my prayers for Your Holiness, beloved brother in Christ, and for the Church entrusted by our Lord to your pastoral care. I also extend cordial greetings to the members of the Holy Synod of the Ecumenical Patriarchate, to the clergy, monks and nuns, and all the faithful gathered in the Patriarchal Church of Saint George for the solemn celebration in honour of Saint Andrew, the first-called and brother of Saint Peter. 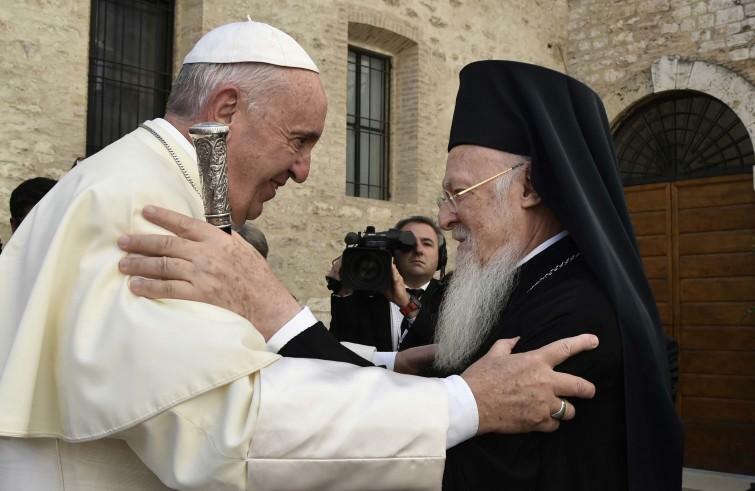 The exchange of delegations between the Church of Rome and the Church of Constantinople, on the occasion of their respective feast days, has become a joyful custom over the years and expresses the profound bond that unites our two Sees. While centuries of mutual misunderstanding, differences and silence may seem to have compromised this relationship, the Holy Spirit, Spirit of unity, has enabled us to recommence a fraternal dialogue. This was definitively resumed by our venerable predecessors, Patriarch Athenagoras and Pope Saint Paul VI, and has enabled us to rediscover those bonds of communion that have always existed between us. Our Churches have safeguarded the Apostolic tradition with great care, along with the teaching of the first Ecumenical Councils and the Church Fathers, despite the differences that developed in local traditions and in theological formulations, which need to be more deeply understood and clarified. At the same time both Churches, with a sense of responsibility towards the world, have sensed that urgent call, which involves each of us who have been baptized, to proclaim the Gospel to all men and women. For this reason, we can work together today in the search for peace among peoples, for the abolition of all forms of slavery, for the respect and dignity of every human being and for the care of creation. With God’s help, through encounter and dialogue on our journey together over the last fifty years, we already experience being in communion, even though it is not yet full and complete. The search for the re-establishment of full communion is above all a response to the will of our Lord Jesus Christ, who on the eve of his Passion prayed that his disciples “may all be one” (Jn 17:21). United we give a more effective response to the needs of so many men and women of our own time, especially those who suffer from poverty, hunger, illness and war. Here I would express my profound gratitude to Your Holiness for your presence at the day of prayer and reflection for peace in the Middle East, held last 7 July in Bari, attended by the Heads of Churches, or their representatives, from that deeply troubled area. It is a source of great comfort to share with Your Holiness the same concerns for the tragic situation of our brothers and sisters in the region. In a world wounded by conflict, the unity of Christians is a sign of hope that must radiate ever more visibly. With this in mind, I also assure Your Holiness of my prayer that God, fount of reconciliation and peace, may grant us Christians to “be of one mind, sympathetic, loving toward one another” (1Pt 3:8). We have been called by God for this, so that we “might inherit a blessing” (1Pt3:9). Trusting in the intercession of our patrons, Saint Peter and Saint Andrew, I assure you and all the faithful of the Ecumenical Patriarchate of my renewed prayerful best wishes, on behalf of the whole Catholic Church. With sentiments of profound esteem and fraternal affection, trusting also in your own prayers, I exchange with Your Holiness an embrace of peace in Christ our Lord.